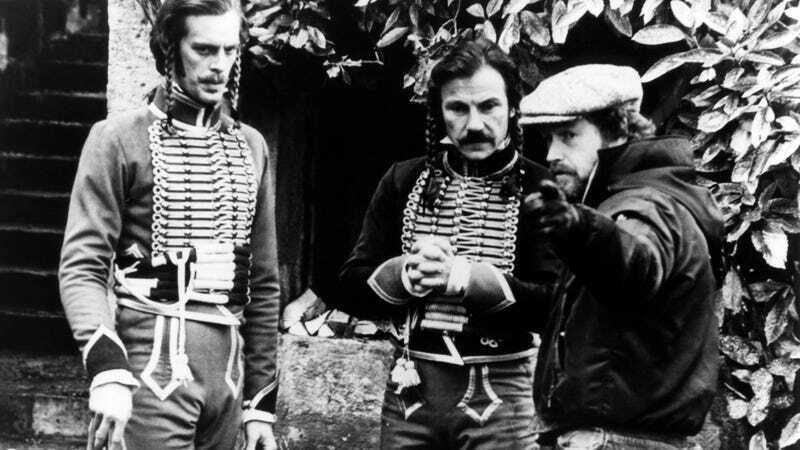 It was 40 years ago today that The Duellists, a visually accomplished adaptation of a Joseph Conrad short story made by a relative unknown named Ridley Scott, opened in French theaters, having already won a special prize at that year’s Cannes Film Festival. It would come to Scott’s native United Kingdom later that year, and to the United States only in the early months of 1978. So the French got Scott first. At 39, he seemed unusually old for a first-time director. But this was a fact of the post-1960s British film industry. Only stubbornly personal directors like Derek Jarman, Terence Davies, and Bill Douglas really worked their way up by making films, and always very slowly. Otherwise, the notable British film talents who appeared in the 1970s and ’80s had two options: either first establish yourself in TV, like Mike Leigh, Alan Clarke (who never left), and Stephen Frears; or make a career in commercials, like Alan Parker, Adrian Lyne, Ridley Scott, and his younger brother, Tony. Today, there’s nothing unusual about directors honing their craft and creativity in commercials or music videos before moving on to feature film. David Fincher, Spike Jonze, Jonathan Glazer, and Michel Gondry all went this route. But in the ’70s, commercial work still carried a stigma. And in retrospect, what’s really remarkable is that Scott and his comrades-in-ads didn’t develop their styles by hawking hip or flashy products; they weren’t selling cars or clothes. No, they were British ad men in the 1970s, which meant that they were tasked with presenting some of the least inspiring products imaginable: powdered detergent, powdered coffee, ground beef, barley water, pens, and, of course, Hovis wheatgerm bread. This nostalgic 1973 ad for Hovis, which is often cited as one of the most successful British ad campaigns, is Scott’s best known pre-Hollywood commercial work. The hallmarks of Scott’s visual style are already noticeable: the murky palette, the smoky lighting, the zoom lenses. But this dusky, magisterial aesthetic was something that he only seemed to have developed in the early-to-mid ’70s, having started in the ’60s as a choppier, more rock ’n’ roll commercial director. Take a look at these two ads: the first for ice cream, made in 1969 and starring a then-unknown David Bowie, who wrote his breakthrough hit “Space Oddity” the week the commercial was filmed; the second advertising Cadbury Flake chocolate bars, made in 1971. ...and another from 1977 for Croft Original—one of several cream sherry campaigns that Scott worked on the ’70s —based on P.G. Wodehouse’s popular “Jeeves” stories, starring a 29-year-old Jeremy Irons as Bertie Wooster. Given the obvious visual predilections of his commercial work, it’s odd that Scott has never made period piece set in the early 20th century. Perhaps he simply got it out of his system. Or perhaps filming picturesque cobblestone streets and dimly lit parlors just gave him an opportunity to work out his pre-modern and futuristic visual interests on a budget; you can glimpse a little Blade Runner in Bertie Wooster’s reflective monocle and the Art Deco mirror behind him. Everybody has to start somewhere.